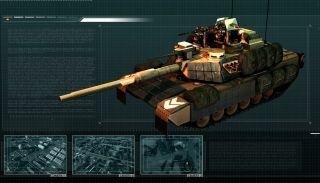 The upcoming RTS Act of Aggression will feature three factions—the Chimera, the Cartel, and the US Army—each with its own strengths and weaknesses. The US faction, on display in the latest gameplay trailer, has been pushed to its limit by multiple deployments and budget cuts, but even though its equipment is aging, it remains a "veteran dreadnought" and a force to be reckoned with. There's a lot to be said for taking the "cheap, simple, and tough" approach to solving problems. Complexity leads to complications; sometimes you just need to find the nail, and hit it with a hammer. But there are downsides, too. In the case of the US Army in Act of Aggression, that means it cannot process more advanced elements, and most of its units cannot be specialized beyond their initial design. US Army bases also require substantial amounts of power, and they're largely defenseless if it gets turned off. Act of Aggression is being developed by Eugen Systems, whose previous releases include the Wargame RTS series—European Escalation, Air Land Battle, and Red Dragon—and, before that, the Act of War games Direct Action and High Treason. The trailer description on YouTube notes that an Act of Aggression "VIP multiplayer beta" is set to take place in "the coming months," while the game itself is expected to launch in the spring. We've asked for a more specific time frame.